With 100,000 costumes, 8,000 extras, 300 sets and a budget that, at the time, was the most expensive in MGM's history, Ben-Hur is widely considered to be one of the most accomplished Biblical-era epics ever made. Based on Lew Wallace's best-selling novel and adapted by Karl Tunberg and a number of uncredited writers including Gore Vidal and Maxwell Anderson, Ben-Hur stars Charlton Heston, Hugh Griffith (Sheik Ilderim), Stephen Boyd (Messala), Jack Hawkins (Quintus Arrius), Haya Harareet (Esther), Martha Scott (Miriam), Sam Jaffe (Simonides) and Frank Thring (Pontius Pilate). Heston brings a solid physical and moral presence to the title role of Judah Ben-Hur, and his charismatic performance earned him one of the film's 11 Academy Awards (a feat equaled only by Titanic and The Lord of the Rings: The Return of the King). In addition to the Best Actor award, Ben-Hur also captured Oscars® for Best Picture, Best Director (William Wyler), and Best Supporting Actor (Griffith). The movie was filmed in a process known as MGM Camera 65, one of the widest prints ever made with a width almost three times its height. This allowed for spectacular panoramic shots and bold action sequences. Even by today's standards, Ben-Hur's now legendary chariot race still astonishes. The lack of computer-generated effects, the visually stunning MGM Camera 65 process, and excellent cinematography all make the scene one of the most memorable in modern cinema. 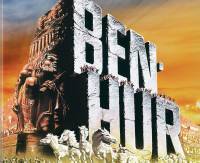 Buy the Ben-Hur 4-Disc DVD Collector's Set Now!